Chance is that you have Microsoft Internet Explorer installed if you are a Windows user. It is there even if you do not use it. What makes things worse for many is the fact that a lot of third party applications use the scripting engine of Internet Explorer to display web contents. A popular example would the the gaming platform Steam for instance. This means that even though you think that you are not using Internet Explorer you might still be using it in those third party applications. This outlines why it is of utmost importance to keep Internet Explorer up to date to avoid attacks against the web browser in those third party applications. The first step to find out if Internet Explorer can be updated is to find out which version is installed on your computer system. Vista and Windows 7 users can click on the start orb in the left lower corner and type Internet Explorer into the run form to launch Internet Explorer from the results. Windows XP users might find the Internet Explorer entry in their start menu as well. Press Alt-H once the web browser opens and select About Internet Explorer from the menu. A window will be displayed that lists the version of the installed Internet Explorer browser. There are basically three possibilities here: Internet Explorer 6, Internet Explorer 7 or Internet Explorer 8. If you run Internet Explorer 6 or 7 you can update to version 8 of the browser which is recommended. 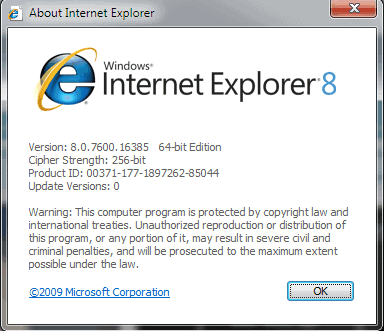 Internet Explorer 8 users are running the latest version of the browser. It can still be that they are missing security updates that have been released by Microsoft. Users who are not running Internet Explorer 8 can visit the IE download site to download the latest version of the web browser. The installation will update Internet Explorer to version 8 regardless of the previous version installed on the system. The second step - which initial Internet Explorer 8 users have to perform as well - is to check for security updates for the web browser. This is best done via Windows Update. Microsoft will automatically scan the installed software programs and display all patches that are available for the configuration. Please note that you might not be able to update Internet Explorer if you are working in a business environment. It is not a chance, it’s mandatory. You can’t install windows without installing IE, and you can’t uninstall it either as it is build into Windows. Uhm, not really, in Europe, Windows 7 is made differently, they have to give a choice to the user of which browser they want. Oh and in the article, about Steam, i think now it uses webkit instead of IE, they updated it about 2 weeks ago, major overhaul of the GUI. Stef as far as I know IE8 still ships with Windows 7 in Europe. Even if the users opt to use a different browser IE8 remains installed. Is it possible to run IE 7 and IE 8 in the same winxp installation? And if so, how? Hey great post. Keeping your browser updated is one of the best ways to stay secure. Thanks, Martin, I didn’t remember that post. actually i am using IE 6 in xp but i want use any new updated version like 7, 8 so can i update IE6 if it’s possible then how???? To run your internet browsing fast its need to upgrade your all internet browser with the upgraded version. All browser will notify you automatically if you are regular user of internet.